Read this on the back of loving the Cupcake cafe book by the same author. This was more of the same and definitely a lovely story. 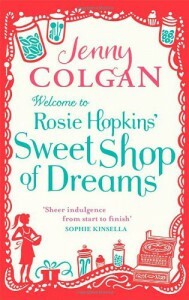 The sweet shop references were a little difficult for me to appreciate fully having not grown up in the UK but I loved the feeling of the characters and the storys that mixed through the book. I admit I skimmed over some of the descriptions of sweets but I don't have a sweet tooth so that might explain that. Would totally recommend as a nostalgic look at a life most of us will never have and some very well crafted characters again.